Seal Tech Insulators can improve your bottom line and eliminate some of the hassles that typically plague commercial and agricultural buildings. Using spray foam insulations from DEMILEC (USA) between floors and walls of schools, office buildings, apartment buildings, hotels, motels, etc. effectively reduces distractions due to noise and odors. By eliminating air leakage, you eliminate the ability for these airborne annoyances to travel. 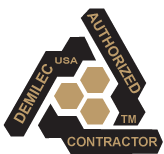 Spray foam insulations from DEMILEC (USA) actually offer a return on investment. The savings over time will more than pay for the initial investment and unlike other insulation materials typically used in commercial and agricultural buildings, they don't sag, settle or deteriorate over time making a permanent solution. As well, you won't have to worry about corrosion or rust.